If you're taking vitamin supplements, you might occasionally notice that you're feeling bloated, and wonder whether the vitamins are to blame. While vitamins can't cause bloating, a mineral often included in multivitamin pills can slow your digestion and make you feel gassy, constipated or a bit sick to your stomach. Vitamins are micronutrients, which are components of food that you need in small quantities each day but which don't supply you with any energy. 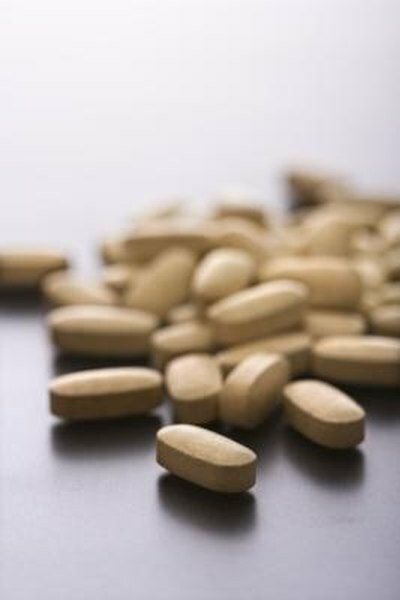 While vitamins can't act as cellular fuel, they are nevertheless critical to cellular function. Some assist enzymes, which are proteins that regulate chemical reactions in the body, while others participate in a wide variety of cellular processes, explain Drs. Reginald Garrett and Charles Grisham in their book "Biochemistry." There are a number of things that can make you feel bloated, but generally speaking, you'll feel bloated if your digestive tract slows down. When this happens, you may produce more gas, which fills your intestines and leads to the sensation of bloating, and you may also go quite some time without passing stool, which can also produce the feeling of bloat. Certain foods and medications increase your likelihood of feeling bloated, as do some hormones. Vitamins that occur naturally in food don't make you feel bloated; neither do those that you take in the form of supplement pills. However, many multivitamin supplement pills also include minerals, which are another class of micronutrient. The mineral iron, which you use to help you make red blood cells, can slow down your digestive tract and make you feel quite bloated. This is particularly true if you're taking large quantities of iron in supplement form. The iron in food generally doesn't cause this. If you're taking vitamin supplements and are having trouble with bloating, try switching to a brand without iron, provided you are not pregnant, breastfeeding or taking iron at your doctor's suggestion. Pregnant and breastfeeding women--and anyone else who has to take iron--might try looking for a slow-release iron supplement, which will be gentler on the digestive tract, explain Drs. Michael Roizen and Mehmet Oz in their book "You: Having A Baby." You can also try increasing your fiber and water intake.